With an Afterword by David Edwin Harrell Jr.
A spirit of religious revival blazed across the United States just after 1900. With a focus on Holy Spirit power, early adherents stirred an enthusiastic response, first at a Bible school in Topeka and then in a small mission on Asuza Street in Los Angeles. Almost immediately, the movement spread to Houston, Chicago, and then northeastern urban centers. By the early 1910s the fervor had reached most parts of the United States, Canada, and northern Mexico, and eventually the converts called themselves pentecostals. Today there are pentecostals all over the world. From the beginning the movement was unusually diverse: women and African Americans were active in many of the early fellowships, and although some groups were segregated, some were interracial. Everytwhere, ordinary people passionately devoted themselves to salvation, Holy Ghost baptism evidenced by speaking in tongues, divine healing, and anticipation of the Lord’s imminent return. This movement saw itself as leaderless, depending on individual conversion and a radical equality of souls — or, as early devotees would say, on the Holy Spirit. But a closer look reveals a host of forceful, clear-eyed leaders. 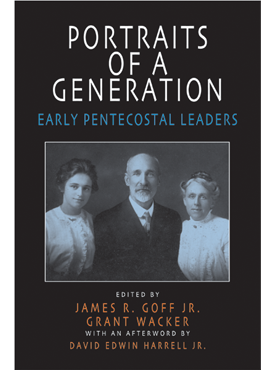 This volume offers twenty biographical portraits of the first-generation pioneers who wove the different strands of Holy Spirit revivalism into a coherent and dramatically successful movement. James R. Goff Jr. is a professor of history at Appalachian State University and Chief Historical Consultant of the Southern Gospel Music Hall of Fame and Museum. He is also the author of Fields White Unto Harvest: Charles F. Parham and the Missionary Origins of Pentecostalism and Close Harmony: A History of Southern Gospel. Grant Wacker is an associate professor of American church history at Duke University and a senior editor of the journal Church History: Studies in Christianity and Culture. His publications include August H. Strong and the Dilemma of Historical Consciousness, Religion in Nineteenth Century America, and Heaven Below: Pentecostals and American Culture. David Edwin Harrell Jr. is Breeden Eminent Scholar in the Department of History at Auburn. His books include All Things Are Possible: The Healing and Charismatic Revivals in Modern America.